Just to the northeast of the Shrine of Justice, by the waterfall. History: I wish I could go into more detail on this strange place of Britannia, but unfortunately I am unable to. Ye see, Aegis has turned into a hermit of sorts and I am nay able to aquire any decent information to relay to ye, the reader. Nay, I am not saying these words to upset Aegis or to make him go back further into the recesses of the wilderness, but to let ye know that Im trying to do what I can to find out more about this township of sorts. I do know that there is some strange magicks that are used there called Istari and mayhaps these strange powers have done something with Aegis that hes unable to surface in the public eye again, but I pray not. 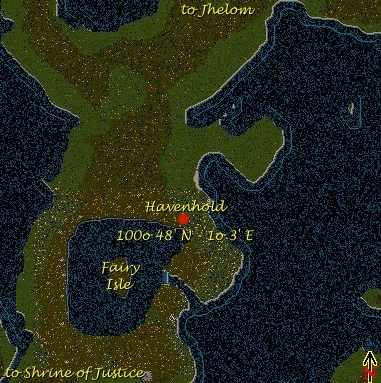 Should ye know anything about the township of Havenhold, would ye please let me know so that I may accurately finish this site and show it the respect it truly deserves. Thank ye in advance, by the way.